The only documentation on the Raybari's during British RajThe Forgotten Palaces of Calcutta reveals the old buildings of the city, where heritage houses and history fill every crowded lane and secret courtyard. The great houses of Bengal's merchant princes have been largely forgotten and rarely photographed. The great families experienced enormous changes in fortune over the centuries, from great wealth and power during colonial times to dramatic economic and social upheaval after India's independence. For the remaining occupants, their ancestral homes are bitter-sweet symbols of family pride, difficult to restore, or sometimes even to maintain. 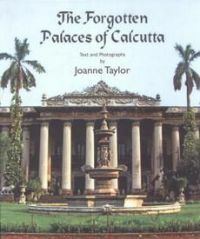 By focusing on Calcutta's heritage mansions and palaces, many of whose interiors have remained the same for over 200 years, The Forgotten Palaces of Calcutta makes an important contribution to the architectural history of both Calcutta and India.Contents:Preface; Introduction; Culture Dictates Form; Crowded Lanes and Secret Courtyards, Style and Construction; A New Urban Culture; Wealth and Competition, Urban Rajahs Set the Standard; The Spirit of a Great House; The Home of the Tagores; Maintaining the Past; Marble, Mirrors and a Rubens; The Palace of the Mullick Family; Tradition and Identity; Splendid Ruins, Architectural Expression and Independence; European Style in Calcutta; The Maharajah of Burdwan's City Palace; East and West, Old and New; Thanthania, the Great House of the Laha Family; The Power of the Image; The Deity at Home, Religion and Everyday Life; Rural Splendour; Ruined and Forgotten, the Andul Raj Bati; Quiet Contemplation; Country Life in Rural Bengal; End Note.